Although these Cuba tours are specially designed to meet US legal travel requirements, travelers from all other countries seeking a fun and unique cultural experience are welcome to join! On this introductory Cuba tour for American citizens, learn about life in Cuba, from big city to rural to coastal living. We use privately owned Cuban guesthouses, and the tour is escorted by one of our celebrated English speaking local tour guides. Starting at US$2350 / person. Explore Cuba from the west to the east. 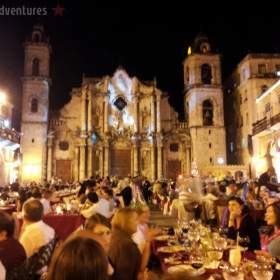 Experience Cuba’s regional differences in culture and cuisine on this Cuba tour for Americans. Meet the Cubans and learn about their history, society, and culture first-hand with one of our local Cuban tour guides. A memorable holiday experience in Cuba, from a Christmas Eve street party in Remedios to a Tropicana style New Year's Eve party in Havana. On this Cuba tour for American citizens, experience local Cuban culture and learn about Cuba’s history and society with an experienced local Cuban tour guide. Are your Cuba tours for young/old people? What is a "People-to-People" tour? Can I stay in Cuba after the tour?